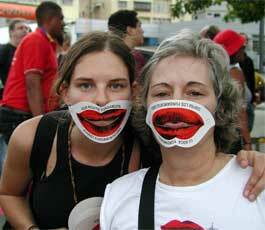 Participants at the 2006 World Social Forum in Caracas, Venezuela wear masks that read "Your mouth, fundamental against fundamentalism" both in English and Spanish. Under the slogan “Another World is Possible,” the World Social Forum (WSF) provides a space for political activists to reflect and strategize on struggles for social justice and against neoliberalism and imperialism. Venezuela was a logical choice for this year’s meeting since under the leadership of left-populist Hugo Chavez it has become the world’s most serious challenge to the Washington Consensus. Nevertheless, even while trying to build another world based on principles of participatory democracy and social justice, internal contradictions remain in the WSF. One of the most notable are weaknesses in maintaining gender inclusiveness. The majority of participants in the WSF are women, but most of the presenters on panels are men, continuing the stereotype that men are the producers of knowledge. The raises the question of what the WSF will do to assure more participatory democracy in terms of gender balance? At first brush, Venezuela would seem to embody the same gender problems that plague the WSF. Like most of Latin America, Venezuela has a long tradition of machismo that emphasizes ideals of male authority and female domesticity. Until 1982, women were classified as a legal minors subject to male authority and control. Venezuela also has an industry that creates beauty queens, manufacturing them as other countries would cars. Since the 1950s, Venezuela has won a record number of international beauty contests, including four Miss Universes and five Miss Worlds and twice has won both in the same year. Schools train and craft women from an young age for these contests. The cult of beauty is supported by a massive cosmetic, plastic surgery, and fashion industry. In 1999, Venezuelans spent a fifth of their personal income on beauty products. Plastic surgery in Caracas is the most profitable industry in South America. For middle-class women, beauty contests provide a clear path for social mobility. Yet, none of the beauty queens come from Indigenous or Afro-Venezuelan communities. The Miss Venezuela contest helps reify white European constructs of beauty. A wide gap also remains between ideals of machismo and the reality of female-headed households, sexual violence, and high rates of illegitimacy. A 1970s petroleum boom led to urbanization and an expansion of education, health care, and employment that helped raise women’s status in society. This translated into legislative changes, including a 1997 suffrage law that required 30 percent of a party’s candidates to be women. Sometimes called the non-sexist Magna-Carta, the constitution incorporates non-sexist language references positions with both their masculine and feminine Spanish forms (such as “presidente” and “presidenta”). This makes an explicit statement that women participate equally with men in politics. Earlier women’s movements had splintered along class lines, and the same was true for Chavez’s government. Poor people are more likely to support the Bolivarian Revolution than white women who become beauty queens, and Afro-Venezuelan and Indigenous women form a particularly strong base of support. At the same time, as in the WSF there is a certain gap between the ideals of gender equality and its implementation. Chavez has set a goal of 50 percent of women in public posts, but the government continues to fall short of that. More significantly, to the chagrin of both supporters and opponents Chavez withdrew the law that required women comprise 30 percent of the candidates for political office. While both the WSF and the Venezuelan Bolivarian Revolution hold out the promise and ideals of gender equality they have fallen short of these goals. Nevertheless, both represent a profound social transformation which challenges discrimination, prejudices, and injustices against women and marginalized peoples. It is difficult to undo centuries of oppression in a few short years, but advances are being made. Both the WSF and the Bolivarian Revolution can support and challenge each other in the struggle for the construction of a new humane society based on principles of social justice and gender equality.